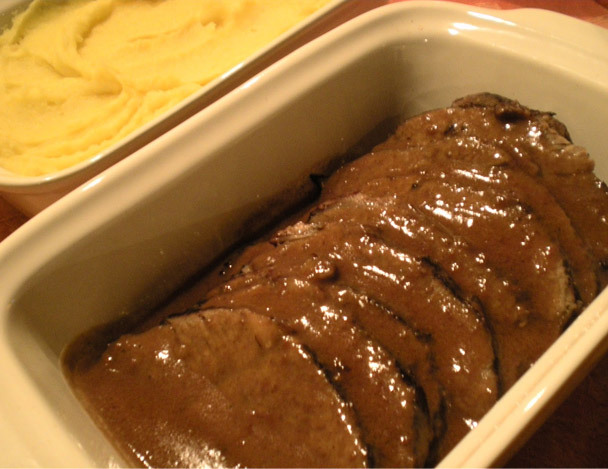 Brasato all’ Amarone Vejo is a classic, elegant dishes, and really does require a hearty red wine, to come out right. Begin the day before you plan to cook the meat. Slice the onion, celery, and carrot, and put them in a bowl with the meat, bay leaf, and peppercorns. Pour the Amarone Vejo over the mixture and marinate it until the next day, turning the meat occasionally. Remove the meat, reserving the marinade, and pat the meat dry. Strain the marinade, bring it to a boil, and cook it until it's reduced by half. In the meantime, tie the meat with string so it keeps its shape and brown it in a pot with the butter and prosciutto fat. Once it's well browned on all sides, sprinkle the cognac over the meat, if you're using it, and light it. When the flames have gone out, season the meat with salt, pour the reduced marinade over it, add the vegetables that it marinated with, cover everything, and simmer over a low flame until the meat is done, about two hours. When the meat is done remove it to a platter and remove the string. Remove and discard the bay leaf. Remove the vegetables with a slotted spoon and either put them through a food mill or blend them. Degrease the sauce, stir the blended vegetables back into it, pour it over the meat, and serve. The meat should be so tender it could be carved with a spoon. Serve it with mashed potatoes or a steaming polenta, and the other vegetables you prefer. And, of course, a bottle of Amarone Vejo.